Group M (17yrs +) RHUM (Salisbury's Dam) 13th August-lst September. David Nichols, Stephen Rossiter, Mark Schofield, Graham Tarling, David Thomas. Rhum 1978 can claim two definite achievements; we did actually get to Rhum (second time lucky for our many veterans of Loch Shiel) and we scarcely saw a midge while there. That much-feared creature, commemorated in song, SHS report covers and certain swellings, was missed only by Bruin, who had intended doing a project on them (“Och well, have tae be house-flies instead”). Our good fortune in this, as in many other matters, was due to our camping at Harris rather than at Salisbury’s Dam, the Society's usual site. Exposure to the prevailing wind blew the midges away while we were snug in the shooting lodge. This palatial abode had such unheard of luxuries for an SHS expedition as hot running water and, dare one mention it, a bath. 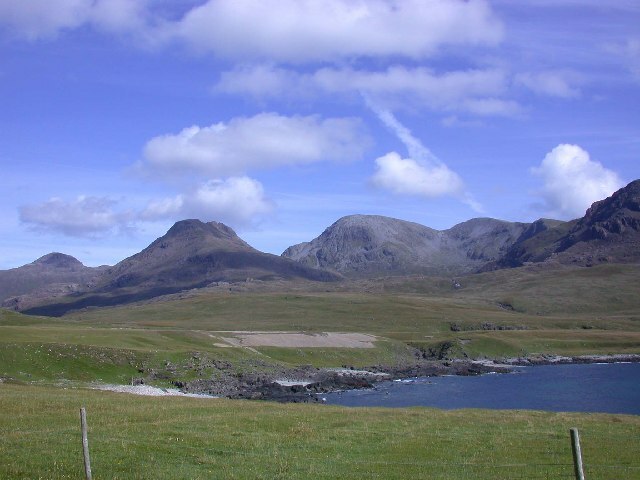 The site and situation of the camp must be among the finest in the Hebrides; the bay, The Rhum Cuillin and, a hundred yards from the lodge, the strange little Greek temple built as a tomb for the Bulloughs, former owners of the island. Highland cattle, Rhum ponies (one of whom had a rather unfortunate encounter with the leader's tent) and red deer were regular visitors, as were the Nature Conservancy staff, who gave many a weary traveller a lift along part of the seven-mile track to Kinloch, to sample the fleshpots. Any expedition to Rhum must owe a great debt to the assistance of the Nature Conservancy and the generosity of their staff. In particular, I must thank the Chief Warden, Mr. Sutton, Angus the foreman and the Chief Stalker. A party our size is inevitably a nuisance and interferes with the normal running of the island as a centre of research, but they made us feel honoured guests. Perhaps the extent of our privilege was Harris, isle of Rum. summed up in an encounter with a day visitor to the island who only wanted to know if "Harris was beyond Marker 11” (on the Nature Trail, i.e. beyond a mile from Kinloch). Our main projects had been suggested by the Nature Conservancy; a count of the goats around the coast (repeating a survey made by the SHS in 1973), a census of the shearwater burrows on Trallval (the active ones being identified by smell) and a survey of the bird population of the Harris tree plantation. In the event, the last of these was done by Tim Reed, a research student at the Edward Grey Institute of Field Ornithology, Oxford, who stayed with us for a week; several members were able to assist him with his work of netting and ringing birds. Bruin supplied our anglers with a good excuse for staying around camp with his fish project while Buckles spent many happy hours looking at wee beasties through his microscope. Our activities were somewhat limited by the weather, particularly the mist on the tops; only one party was able to complete the famous ridge walk, although the bird watchers indulged in various strange rituals in the mountains, including three bivvies to Hallival to see the largely fictitious Manx Shearwater; any bird which only lives in holes on the very tops of mountains on remote islands and only comes home on particularly wet and cloudy nights must have been created as a status symbol for masochistic ornithological loons (Bruin, take a bow…..) - how the leader was persuaded to join them for a night I will never understand. Ken and Tom managed to give all who wanted some climbing on crags near camp or on the west face of Ruinsival, while the select few were introduced to such arcane arts as prussicking and Simon Lord demonstrated the possibilities by going walking or climbing every single day of the expedition. Canoeing was limited by the lack of protected water but several members were able to make a quick tour of Loch Scresort on our way home. 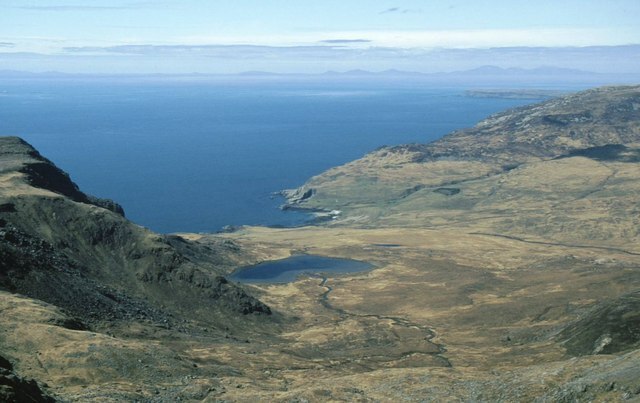 The bealach south of Ainshval. 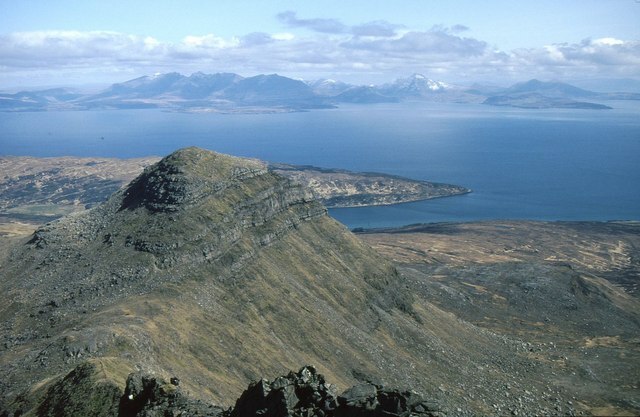 Ainshval on the left, Askival on the right, Hallival in the centre. Other highlights: Fred ‘n Dave Tables Inc. (don't worry if the top is four feet up, we can always raise the seats), visiting the Sea Eagles (magnificent creatures and an experience for which we must thank John Love, N.C.C. ornithologist, the winking game (beware the evil eye of the Hickmott), the castle (something I missed due to a crazy dash up Askival as it was my last chance) and the day Tom finally issued our chocolate ration (a quarter pound each). I have wanted to visit Rhum for a long time; now I want to go back. Looking down the north ridge of Askival to Hallival. Hallival is obscuring the head of Loch Scresort. 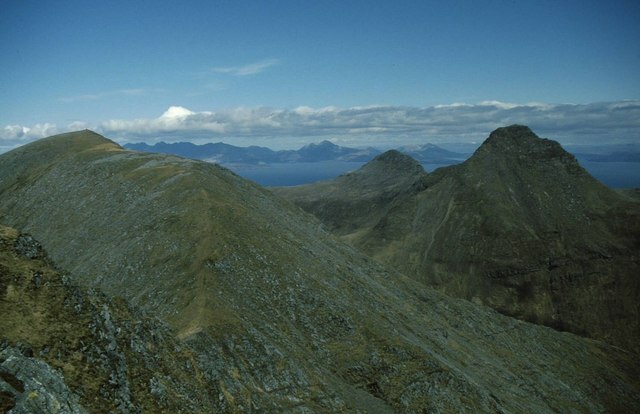 The Cuillin of Skye beyond Hallival.